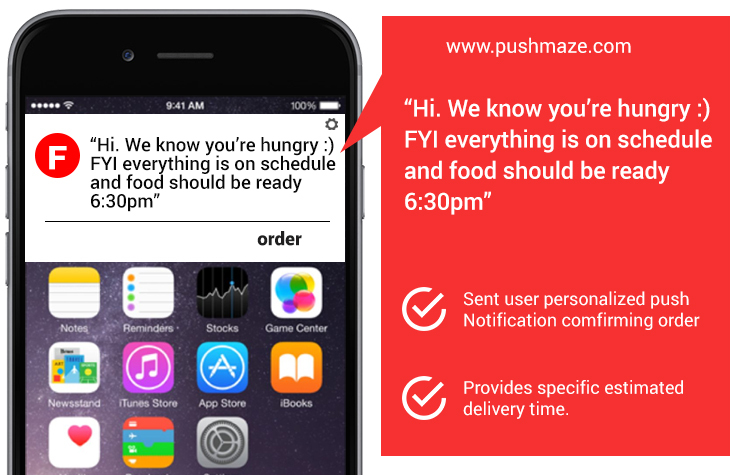 What is push notifications & How do push notifications work? What is push notifications how it works? What are push notifications used for? What is push message service and what does it do? How push notifications helped these brands to boost their consumer engagement? We are undoubtedly in a decade that is experiencing rapid changes in the way marketers and consumers behave, especially with the transition towards digital media. 76% of people think that the marketing trends have changed rapidly in the past few years than the previous fifty years, according to an Adobe digital survey. Modern marketers are continuously looking for ways that fulfill the demands of online consumers to master an Omni-channel approach, to fully connect the online, mobile and in-person experience. Today we are going to talk about what is push notification? The online consumers now have full control than before. The rise of mobile devices, wider reach of internet and abundance of resources in the digital space have enabled a seamless communication for consumers and interact with the brand whenever they want. This makes them well informed and would research on immense amounts of brand content online before making purchase decisions. Not only are they typically aware of the marketing tactics, but also have higher expectations when it comes to brand interaction. One powerful tool that can help the marketers fulfill their consumer’s ever-changing demands is popup notifications. 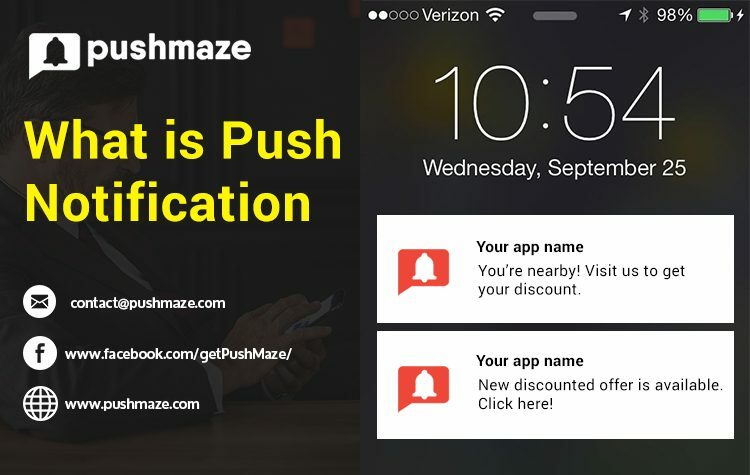 Before seeing what is push notifications and how push notifications works, let us look at some major challenges faced by marketers today and some stats where push messages are at their rescue. This is one of the most haunting nightmares that every marketer faces today. Due to the increasing number of businesses in every industry vertical, the consumers are left with a variety of options to choose from. Marketers hence have to clearly understand the interests of their consumers and frame a sophisticated strategy accordingly. With segmented targeting using a popup (we will discuss this clearly later in the article), client retention rate goes up to 93%. Tracking down the online consumer’s mind, understanding their preferences and delivering personalized content accordingly is every marketer’s dream. A targeted push marketing strategy can help to segment the audience based on their interests and send relevant information. Notably, 70% of consumers find them to be useful, and 52% look for relevant information and personalized offers in the push messages they receive. When a consumer shows interest in a particular product or a service, they would expect the brands to respond as quickly as possible. Unlike other modes of marketing like Email and SMS, Push notifications aren’t hidden up in your system apps and are instantly displayed on the screen. The Average opening rate is 90%, which is 50% more than the most commonly used marketing mode, Emails. Also, the click rate for chrome popup notifications is 7 times higher than that of Email marketing. Despite engaging content, marketers find it difficult to reach and continuously engage its audience through conventional platforms. Online consumers are looking for a better mode that is new and unique, to provide a personalized way to interact with the brand. 70% of the audience finds it to be useful, and 55-60% willingly opt-in for it. These are clickable pop-up messages that appear on the subscriber’s screen. App publishers can send the push notifications at any time, and the best part is, users can be reached even when they are not on the brand’s page. They reach the devices in which they are online and just have to keep the browser running in their device. The main advantage is the level of convenience it offers to the consumers. Real-time news, live scores, traffic and weather reports, order delivery tracking are some of the categories most consumers use it for. Brands can take advantage of this for promoting their products, to increase customer experience, and provide a better support for their consumers. Here are some crucial business elements and how to setup push notifications service make it easy for the marketers in managing their brands. Consumers today are not comfortable in disclosing their personal information. It helps you to add your subscribers with single-click permission and engage with your brand without asking your users to reveal their personal data. The consumers can also turn on push notifications and turn off push notifications as per their convenience. When a visitor shows interest in your website, you need not wait for them to come back and perform the desired action. Sending a push message can easily help to re-engage with them. Remember, when you are trying to re-engage with your returning visitors, make sure you provide them with exclusive content or a limited time offer that will interest them. 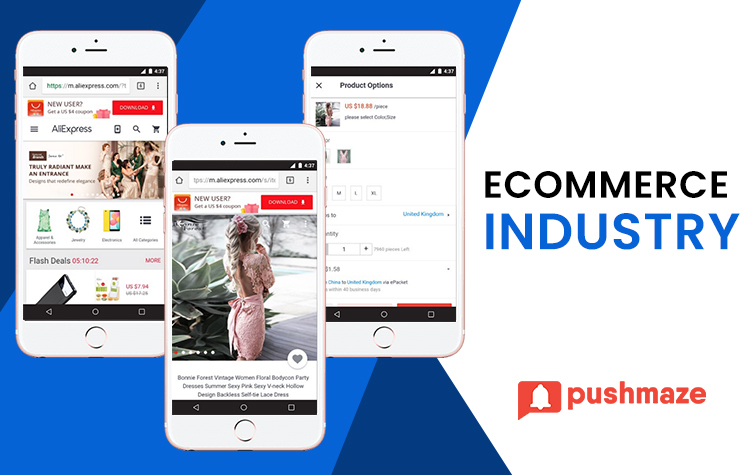 Web push notification service can help you to directly reach your audience on their smartphones even if you don’t have a dedicated mobile application. Usually, it sent to your consumers will be instantly delivered to their devices. According to reports, 40% of the consumers read and respond to the popup messages within one hour of receiving them. As they have a limited word count and reach the consumers without them taking any external action, they are simple and easy to understand. Also, using rich push messages (with a rich media attachment like images and GIFs) will give your consumers a more interactive feel. In this digital world filled with competition, remarketing is crucial for products of all segments. As per the consumer’s purchase history, you can notify them on relevant offers and recommendations, helping them take instant purchase decisions even if they hadn’t planned on it. For instance, if a consumer frequently orders food of a particular cuisine from your food delivery app, you can send across a reminder when a new dish of the same cuisine is added or on any exclusive discounts. Compared to all other modes of segmented marketing like Social Media, push messages to receive a much higher engagement rate. When users are targeted based on their demographics and interests, sending a personalized push message will precisely fulfill their expectations from a brand, enabling them to instantly engage with your brand. As we had seen earlier, the average client retention rate for segmented push notifications is around 93%. For the ROI to be high enough to justify your marketing budget, should you stick to the traditional SMS and Email modes, or try to push message service. The table below can help you in making the right choice. In 2009, Apple introduced APNs (Apple Push Notification service) that enabled app developers to transmit information to iOS, macOS, watchOS and tv OS devices. In 2010, Google launched C2DM (Google Cloud to Device Messaging), its version of push notification services for Android devices. Rich notifications and call-to-action buttons were introduced by Google in 2013, allowing the developers to integrate enhanced features for Android push notifications. They are the most preferred marketing automation channel, mainly used for promotions, re-engagement and client retentions across diverse industries. These typically include coupon portal, price comparison or review websites. 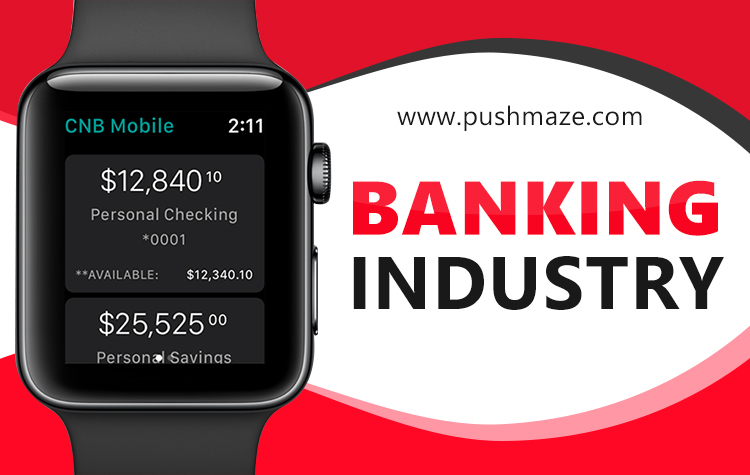 Working in a highly competitive environment where an average consumer visits around 5 websites before completing a transaction, they definitely need a powerful tool like Push notifications to withstand such a competition. 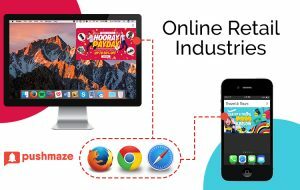 These affiliates mainly use them for retargeting, driving their affiliate brand’s exclusive offers, category offers and flashes sales. Customizing the communication with consumers. Seasonal and occasion based sales. Push alerts on new collections. Flash sales like discount offers and cashback offers. With over $210 billion market value, online food delivery is an extremely competitive space. Website push notifications are the best solution for them to leverage geographical targeting and real-time communication with their consumers. They are swift, and drive repeated visits, encouraging the audience to explore a cuisine and make new purchases. Some of their uses include sending notifications on exclusive discounts offered by specific restaurants, special offers like the weekend and daily discounts, recommend new restaurants and dishes with segmented push, order tracking & delivery. 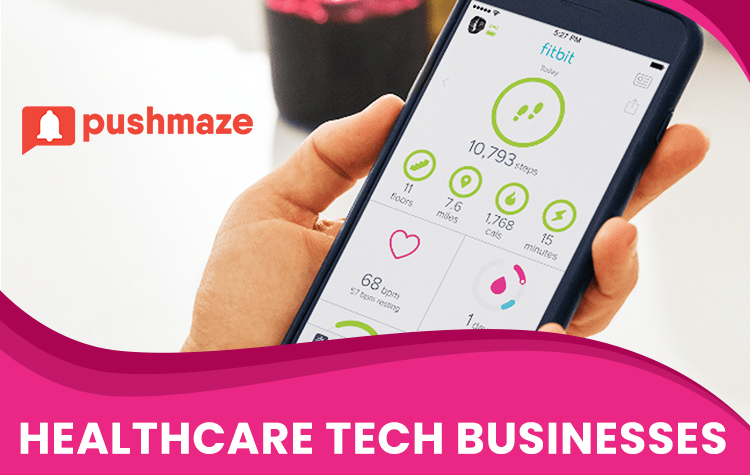 Healthcare tech is an emerging industry in digital media that employs google push notification services for driving their user acquisition, reminders and alerts (on medicines that are back in stock, order status, timely purchase alerts, consultation and appointment reminders for doctors and patients), driving user engagement and re-targeting. Web push notifications give the thriving BFSI sector a refreshing method of engaging with both desktop and mobile users. Some of the cases explored by this sector are in Content marketing, Announcements of offers and alerts, cross-selling and upselling and Transactional communication. Another industry where push notifications are integral is Travel and hospitality. They use it for segmenting users and retargeting based on demographics and locations (price slash alerts, upsell, cross-sells), content marketing driven lead campaigns, announcements, building curiosity, information on new packages (like weekend packages, occasion-based packages, gifting and customizing), reminders and alerts, reward programme for members, feedback and confirmation alerts. 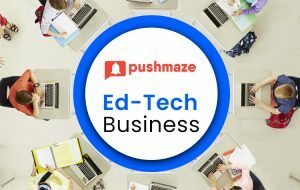 With education probably facing the fastest transformation towards digital media, a push marketing strategy can be their ideal tool for retargeting, content marketing, cross-selling, upselling, offers and course updates. With segmentation being the main pain-point for online retail stores, push notifications are benefitting them on various instances like hyperlocal updates (geographical and interest-based segmentation), retargeting, user engagement and customer feedback. With online SaaS businesses growing 5X more than the traditional software sector, the power of this tools here are limitless and can be used in numerous ways such as retargeting, content marketing, product & new version updates, customer feedback, events & announcements. News and media industry has seen an abnormal increase in the number of businesses for the past few years. Having just started to explore on the sophisticated marketing solutions that effectively drive user acquisition and engagement, push notification services can help them give real-time news updates, regular news updates, personalized content delivery & Native advertising. Online content consumption is increasing at a tremendous rate (with popular media like YouTube showing a 100% growth every year). With mobile devices just getting popular in this niche, the benefits that can be reaped through push notifications are countless and can be used for real-time updates (flash and event-based updates), genre-wise content, native advertising, retargeting, reminders & announcements. 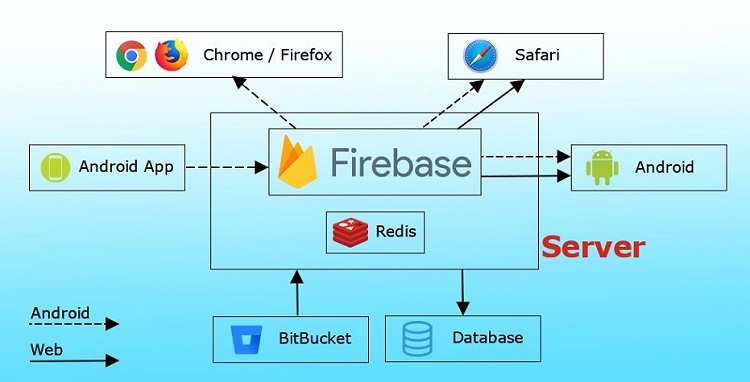 The core of push notifications is run through services like Apple’s APNS, Google’s Firebase Cloud Messaging (FCM) and Windows Notification service. The first step in the process is to “subscribe” a user to push messaging. It involves two things; receiving permission from the user to send push messages, and getting a “Push Subscription” (that contains all the information of the user’s device) from the browser. Then, the user can be subscribed by generating a set of “application server keys” that allow push service to know the subscribed user’s application server, helping you to trigger the push messages to that respective user. Once you have subscribed the user, you will need to send the “Push Subscription” details to your server, so that it can save this subscription to the database and use it to send the push message to the user. Sending a push message to the user’s device via an API call to your application’s back-end. An API call is to be made to the push service, which would include what data to send, whom to send and how to send the message. Usually, the API call is made from your server’s end. Upon receiving a network request, a push service validates the push message and sends it to the respective browser. 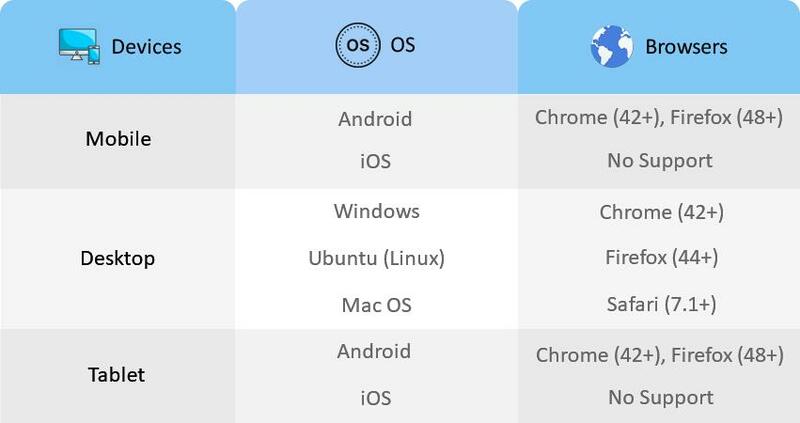 Each browser can use any push service they want, as every push service expects the same API call. -The device comes online and the message is delivered by the push service. 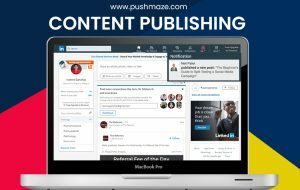 -If the message expires, the push service removes it from the queue and will be no longer valid. A typical push structure consists of a header, a message, an image & a URL. You can choose a relevant image, use emojis along with the text, and keep your message as crisp as possible. As an added advantage to marketers, push notifications now come with the capability of adding two calls-to-action as well. Marketers can now guide their subscribers to three different landing pages with a single notification – one by clicking the notification itself and two other CTAs. One of the important push notification best practices is writing a crisp copy and title, as the recommended character limit is just around 40. Hence using emojis and buzzwords might help. Once you have provided relevant URLs and CTAs, your first successful push message is on its way to your subscribers! La Redoute is one of the world’s largest eCommerce apparel retailers in the world, boasting a turnover of more than $1 billion. La Redoute faced the most common problem like every other eCommerce stores, high cart abandonment rate (adding an item to their cart, and leaving the store before finalizing the purchase). In order to retrieve its lost customers, they planned a mobile push notification campaign to contact the users if they had left an item in the cart. Each notification was highly personalized with their interests in mind and links the user to their cart where they can complete the purchase. To its surprise, the click-through rates were 2-3 times more than what was expected, making their push strategy a great success. Nestle is the largest food and beverage company in the world, with more than 2000 brands and a revenue of over $100 billion. As a part of its strategy to increase the brand loyalty among its consumers, they created the “Croquons la Vie de Nestle” program, offering various push notification campaigns like the welcome program, Loyalty program and more. Among them was the “Lapsed users’ reactivation program” where the mobile app users who have been inactive for 20/25 days are automatically reminded to come back to the app. 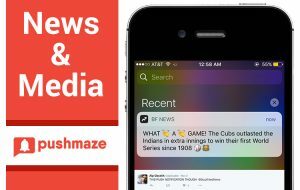 With push notifications expressing the app’s key benefits like editorial nutritional advice and discounts, interestingly, the campaign saw a reactivation rate of more than 10%, which is very high for a firm with extremely large user base like Nestle.